You'll be £12.99 closer to your next £10.00 credit when you purchase Ypres 1914: Langemarck. What's this? Order within the next 57 minutes to get your order processed the next working day! These three Battleground Europe books on Ypres 1914 mark the centenary of the final major battle of the 1914 campaign on the Western Front. Although fought over a relatively small area and short time span, the fighting was even more than usually chaotic and the stakes were extremely high. 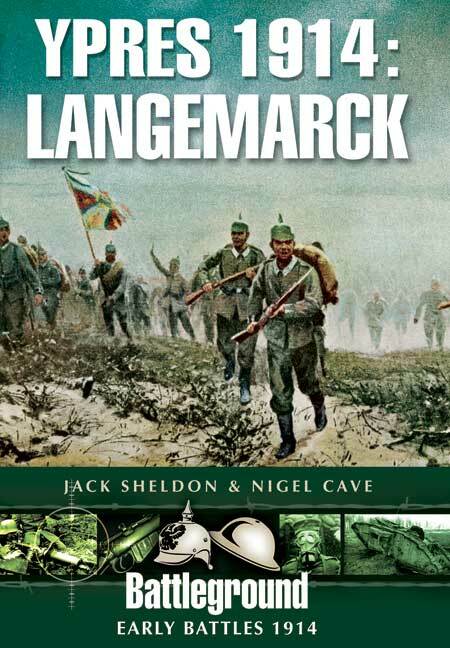 Authors Nigel Cave and Jack Sheldon combine their respective expertise to tell the story of the men – British, French, Indian and German - who fought over the unremarkable undulating ground that was to become firmly placed in British national conscience ever afterwards. When, in October 1914, the newly created German Fourth Army attacked west to seize crossings over the Yser, prior to sweeping south in an attempt to surround the BEF, two things prevented it. To the north, it was the efforts of the Belgian army, reinforced by French troops, coupled with controlled flooding of the polders but, further south, the truly heroic defence of Langemarck, for three days by the BEF and then by the French army, was of decisive importance. The village stood as a bulwark against any further advance to the river or the town of Ypres. Here the German regiments bled to death in the face of resolute Allied defence and any remaining hope of forcing a decision in the west turned to dust. This volume covers the fighting around Langemarck in 1914, as the British and French desperately fought to defend the salient around Ypres. ... With Jack Sheldon and Nigel Cave as authors, you know that you are in reliable hands, and the book does not disappoint. Jack Sheldon is well-known as a British authority on the German Army of the First World War, and this experience and expertise is evident throughout the book. A well-mapped volume and the quality of research and authorship are of the highest standard. This is another readable guide to events at Langemarck in 1914, with two drive and two walking routes. In short it is a most valuable Sheldon and Cave addition to the Battleground series. The book has a very strong and comprehensive narrative as well as all the facts and figures, directions and information for visiting the area you'll ever need. These books are ideal for those who want to learn more about the battles and the area, and for those travelling. As seen in the Burton Mail. As with the rest of the series, highly recommended. The narrative moves along at a good pace and the authors have utilised quotes from some of the soldiers who were there to underline some aspects of the battle. An excellent addition to an outstanding series. Pen & Sword’s ‘Battleground’ series is well-established, currently numbering over 140 titles. This volumes covers the fighting around Langemarck in 1914, as the British and French desperately fought to defend the salient around Ypres. The book covers the period from 20th October – 11th November 1914; at a shade over 200 pages it is able to do so in depth. Whilst British involvement in the fighting ended on 24th October, the book covers the subsequent fighting between the French and German troops in order to provide a fully-rounded account of the action. With Jack Sheldon and Nigel Cave as authors, you know that you are in reliable hands, and the book does not disappoint. Jack Sheldon is well-known as a British authority on the German Army of the First World War, and this experience and expertise is evident throughout the book. The action is presented from both sides, handily highlighted by a German pickelhaube or Tommy’s cap to provide a visual distinction between the two! Nearly 50 pages are devoted to tours of the area (some crossover with Pen & Sword’s ‘Battle Lines’ series here perhaps). The tours direct the reader to many of the points of interest referred to in the body of the book, as well as the usual array of memorials and Commonwealth War Graves Commission cemeteries. Maps are plentiful; in addition Pen & Sword certainly haven’t scrimped on the images and a wide variety, both British and German, are reproduced. This is another valuable addition to the Battleground series and will provide the reader with an excellent introduction to the fighting in this area in 1914. Nigel Cave is the editor of the WW1 books in the Battleground Europe series. He is a member of the Durand Group and has been involved in its underground investigations from its origins. He also has worked for some years with Veterans Affairs Canada. Educated at Inverness Royal Academy, the Royal Military Academy Sandhurst and the Universities of Lancaster and Westminster, Jack Sheldon completed a thirty-five year career as a member of the Queen’s Lancashire Regiment. In 1982 he graduated from the German General Staff course at the Führungsakademie, Hamburg and went on to fill international staff appointments and to command an infantry training battalion. His final post before retirement in 2003 was as Military Attaché Berlin. He now lives in France and has rapidly established himself as an expert in German First World War history. He was an honorary researcher for the Thiepval Visitor Centre Project, is a member of the British Commission for Military History and is the author of the highly acclaimed The German Army on the Somme 1914 – 1916, The German Army at Passchendaele and a number of Battleground Europe titles.